For most diaphragm switching applications the EPDM material is preferred. EPDM has a temperature use range of -65°F to +300°F for sealing most media. 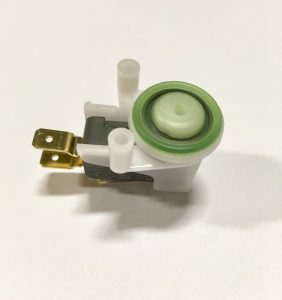 Diaphragm pressure switches using the EPDM material are frequently used with foods, water and steam applications and offer the best resistance to ozone and weathering. They are not used with petroleum oils or fuels because significant swelling would result. The other common diaphragm material is Nitrile. Nitrile is exceptionally resistant to petroleum base oils and hydrocarbon fuels over a temperature range from -40°F to +250°F. When operating the diaphragm switch in a hot temperature environment, VITON or Silicone materials are recommended. These compounds offer good resistance to a wide variety of chemicals and excellent compression set resistance over a temperature range of -20°F to +400°F. Silicone is commonly used in medical or food applications, whereas VITON is similar to Nitrile, but can handle those extreme temperatures. As a quick guide, we’ve put together a simple chart outlining the differences. Our pressure switches available for purchase online are using EPDM or Nitrile material. If another material is better suited for the application, contact our technical support team. EPDM -40 F / 300 F Excellent ozone, chemical, and aging resistance. Poor resistance to petroleum-based fluids. Animal and vegetable oils, ozone, strong and oxidizing chemicals. Mineral oils and solvents, aromatic hydrocarbons. Silicone -80 F / 420 F Excellent high and low temperature properties. Fair physical properties. Moderate or oxidizing chemicals, ozone, concentrated sodium hydroxide. Many solvents, oils, concentrated acids, dilute sodium hydroxide. Viton ® (4), Fluoro-elastomer – 10 F / 400 F Excellent oil and air resistance both at low and high temperatures. Very good chemical resistance. All aliphatic, aromatic and halogenated hydrocarbons, acids, animal and vegetable oils. Ketones, low molecular weight esters and nitro containing compounds. Nitrile (Buna-N) -30 F / 250 F Excellent resistance to petroleum-based fluids. Good physical properties. Many hydrocarbons, fats, oils, greases, hydraulic fluids, chemicals. Ozone (except PVC blends), ketones, esters, aldehydes, chlorinated and nitro hydrocarbons.